If Election 2016 makes you feel like drinking, I can help. Here I’ll make cocktails for each US President. By November, we can drink them all! One died in service to his county. Three died on the anniversary of the Declaration of Independence, two on the same day, one, five years later. Among the first five presidents there were the Commander of the Continental Army, the main voice of the Declaration of Independence, and the father of the Constitution. Here are men who remained friends for life. There were also, among them, men who were friends, and then estranged from each other, and then friends again. The American Revolution and the years that followed were fiery ones which provided the perfect landscape for a variety of passionate men with diverse personalities and visions for the new nation they all had a role in creating. As presidents of a new nation, they set the traditions of the office, and also established the precursors to the partisan politics that are so familiar to us now. Now you can drink them. Candidate cookies are a quick look at the men and women who aspire to be President of the United States 2017-2020. It’s not easy running for President of the United States when you have a long, public political history. It’s also not easy for a presidential biocookieographer to decide how to turn such a candidate into a cookie. Hillary Clinton’s cookie, though, is very informed by the “I’m with her” tagline associated with her logo. This cookie nods to the precarious balance that a female candidate has to strike. This cookie is about the balance between projecting oneself as a strong candidate, but also capitalizing on your feminine edge. Lemons are the perfect ingredient, then, for this cookie. Lemons have a strong flavor. The protective skin, via it’s oil, provides vary strong flavor, so lemon zest is throughout this cookie. There are two types of chocolate in this cookie, but not chocolate chips. This bar chocolate, one bittersweet, one extra dark, is a bit more expensive than many chocolate chips, and alludes to the the dollars that back her campaign. Finally, the cookie is contains a creamy crumble on top, as female candidates are squeezed into paying attention to the way that they come off differently than male candidates do. This is a reminder that such a candidate may have to dust herself with extra sugar from time to time. For substantive information about Hillary Clinton, you might take a peek at her campaign website, or at her Project Votesmart profile page. The Wikipedia page will lead you to some other articles and resources if you scroll down to the bottom. While Ben Carson is no longer in the presidential race, I see no good reason to let a photo of a cookie made months ago go to waste. This cookie makes reference to Ben Carson’s past, something that was a hot topic of discussion during parts of his bid to become to Republican Party’s 2016 presidential candidate. At one point, Carson was on the board of directors for Kellogg Co. With this in mind, crushed corn flakes make sense for an ingredient in his cookie. Better Made potato chips, which are, like Carson, from Detroit are also a part of this cookie. Finally, this cookie contains chocolate chips. Here’s the part where I briefly considered selling you guys a bill of goods regarding the chocolate chip. I thought about telling you that this was a reference to his wife’s name, Candy. I mean, all the most famous candy bars have chocolate, right? But, Ben Carson has chocolate in his cookie because he’s this year’s black candidate. For substantive information about Ben Carson, you might take a peek at his campaign website, or at his Project Votesmart profile page. The Wikipedia page will lead you to some other articles and resources if you scroll down to the bottom. Mike Huckabee, an ex-Baptist minister, is one of the presidential candidates who is a proponent of “family values,” as he defines them. On his website he makes it clear that he will not apologize for his faith nor his values. Some of the positions he takes are Biblical positions, as he interprets them. Some of the criticism that he’s taken during this election cycle ties directly to his religious views. For example, when he said that Josh Duggar should be forgiven for his teenage sexual transgressions against five girls, including his sisters. He did not condone Duggar’s behavior; he said that this was inexcusable. He meant unforgivable in a greater sense. He said also that those who talked about these deeds, suggesting that they were enjoying someone else’s difficulty, “revealed their own insensitive bloodthirst.” Fiery language. 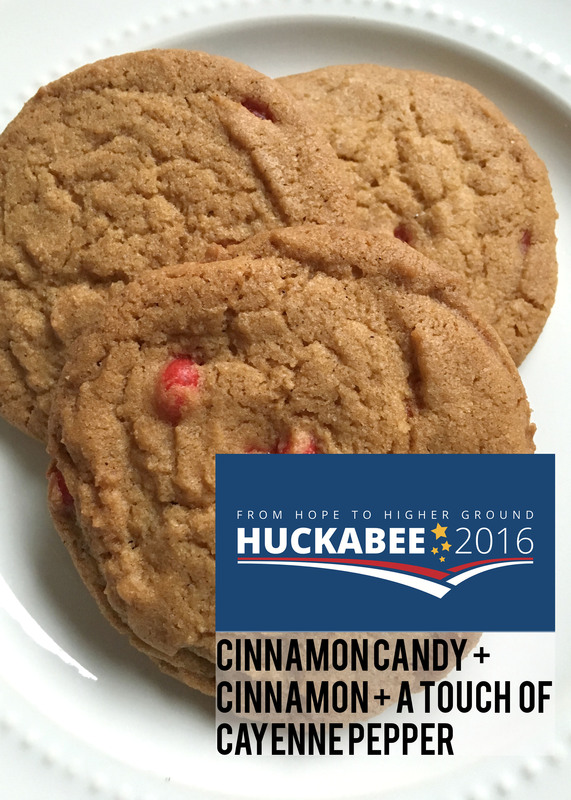 Huckabee’s cookie contains cinnamon, cinnamon candy pieces, and a dash of cayenne. These spicy mix-ins represent fire. They also represent the fire that he believes should be applied to the United States tax system, burning it down to the ground. For substantive information about Donald Trump, you might take a peek at his campaign website or at his Project Votesmart profile page. TheWikipedia page will lead you to some other articles and resources if you scroll down to the bottom. 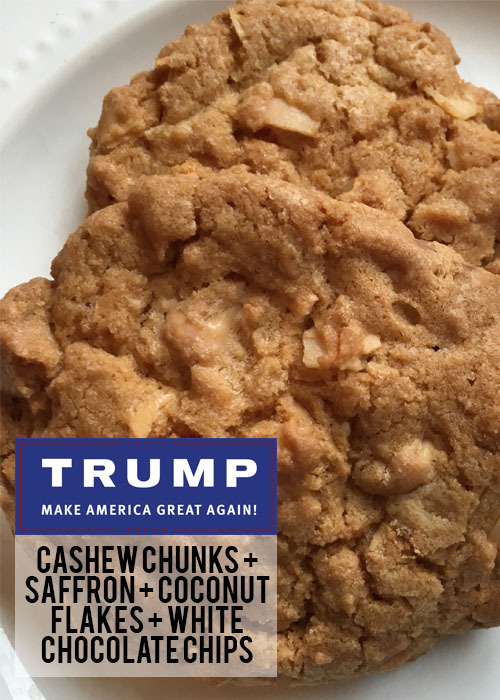 Donald Trump’s cookie references both his personal story and statements that he has made over the last several months. As a billionaire, his cookie should have ingredients that one might not use every day. This is where saffron comes in. Donald Trump comes to us from the world of entertainment. As a result, some of the coverage that he gets is a bit different than coverage of other candidates. This is where the cashews come in. The cashew tree has a short, irregular trunk. There was a whole Vanity Fair article about a claim that Donald Trump has short fingers. The coconut flakes are a reference to Mr. Trump’s famous hair. The flakes sit in the cookie at a variety of angles. Also, the flakes are white when they go into the batter, but those that sit on top of the cookie take on a sandier, never-quite-brown color upon baking. This represents the variety of colors we can observe in Trumps hair if perusing Google images. Finally, Donald Trump’s nativist leanings inspired the inclusion of white chocolate chips. For substantive information about Donald Trump, you might take a peek at his campaign website, or at his Project Votesmart profile page. The Wikipedia page will lead you to some other articles and resources if you scroll down to the bottom. Rick Perry’s cookie takes a look at some of Perry’s favorite things. Rick Perry plays the piano, so white and chocolate chips are used here to represent the ebony and ivory keys. He is said to like popcorn, too so they are also included in his cookie. Because Rick Perry is a fifth-generation Texan, it seemed appropriate to also include pecans since Texas grows a lot of them. For substantive information about Rick Perry, you might take a peek at his campaign website, or at his Project Votesmart profile page. The Wikipedia page will lead you to some articles and other resources if you scroll down to the bottom. Bernie Sanders’ cookie begins with chocolate chips. After all, chocolate chips are pretty classic and Sanders’ history includes a classic immigration story. His father had immigrated to the United States from Poland, and much of his family had been killed in the Holocaust. His grandparents were also Jewish immigrants. His cookie contains dried blueberries, which are a nod to the northeast, where he’s been for most of his life. Sanders was born in New York, and has been a politician in Vermont over the last several decades. The sunflower seeds in his cookie are a nod to his work as a member of the Energy and Natural Resources Committee. Sunflowers are named after the sun, and this particular committee, among other things, deals with proposed legislation pertaining to solar energy. For substantive information about Bernie Sanders, you might take a peek at his campaign website, or at his Project Votesmart profile page. The campaign Wikipedia page will lead you to some articles and other resources if you scroll down to the bottom. I’ve been asked more than once whether I’d make a chocolate cupcake for President Obama because he is the first black president. Actually, most people who ask that say African-American president. However, considering that I have a website that explores the way that we use food language to describe women, I wasn’t too keen on using chocolate to interpret a president just because his skin is brown. But what do you say about a president whose presidency we’re still living through? It’s too early to even summarize it. Making 44 cupcakes, generally, is a challenge. I’ve looked at the presidents through a variety of lenses. Because Barack Obama spent time in Hawaii as a child, I might work that element. However, I’ve tread over Hawaii with the McKinley cupcake. I could use Indonesian flavors because he spent time there, but that’s be almost like Hoover’s cupcake, taking advantage of a place he happened to live for a while. His left-handedness might have made for an interesting interpretation, but many of his predecessors were also lefties. Truman tried to achieve national health care long before Obamacare came along. He’s not even the only president to come to us by way of Illinois. Barack Obama, though, is a reminder that no president is wholly unique. Each president borrows ideas from the men who came before him. Perhaps the presidency is more cumulative than we think. Perhaps the current president can always be viewed as an amalgamation of the previous residents of the executive mansion. Because I chose the amalgamation element, I wanted to nod toward another treat that is defined by the components that comprise it. That made me think of Neapolitan ice cream. So, here we have a vanilla and chocolate chip cupcake with strawberry buttercream frosting. Since the presidency is a complex sophisticated job, the cupcake is filled with red-wine flavored whipped cream. At the end, I decided that the cupcake would have a chocolate shell because with some people, the only thing they’ll ever see is that brown exterior.